Philadelphia Pepper Pot – Dad was definitely not a picky eater but it took him more than thirty years to develop of taste for escargots. He preferred liver and onions. We tried to convince him that escargots were a far better choice than tripe or even calf’s liver. To no avail. 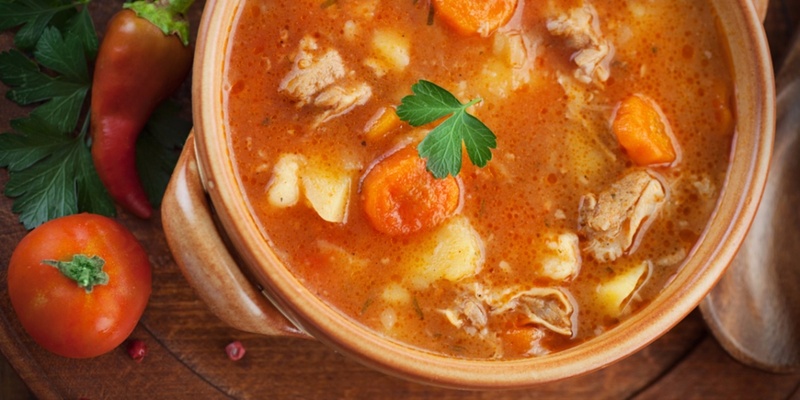 If only we could have served up a piping hot bowl of Philadelphia pepper pot soup! Discontinued in 2010, you can still buy the canned soup if you know where to look! 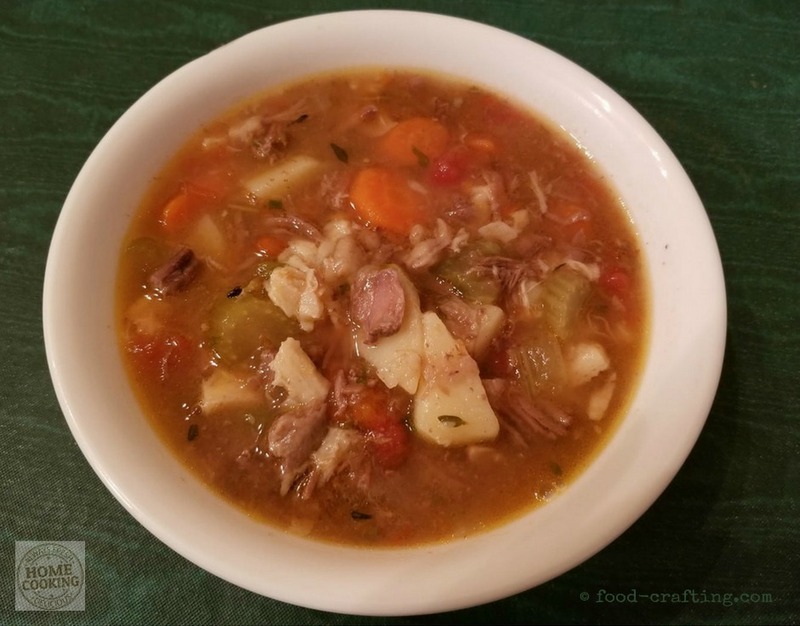 While one of his frequent requests was a steaming bowl of Leek and Potato soup (a taste acquired in France during the war years), Dad also had favorite comfort food soups from childhood days in Pennsylvania Dutch country. Admittedly, this is not an across the board favorite but more of a regional specialty – and a favorite of those who grew up in the Philadelphia area. In other words, it’s a perfect fit for several generations of this family. 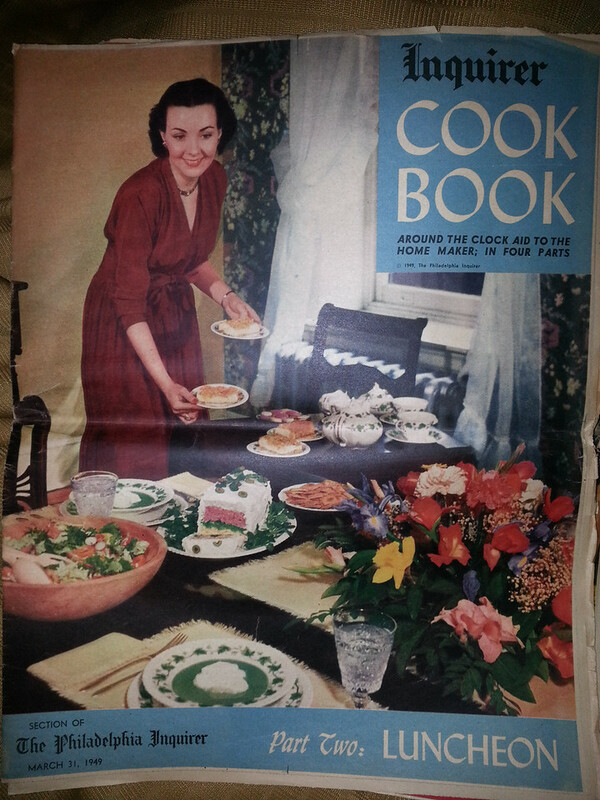 The first recipe is from the Inquirer Cook Book, an insert of the Philadelphia Inquirer dated March 31, 1949. But… I’ve also developed my own recipe for this traditional soup. It’s a soup that keeps well and tastes even better reheated! 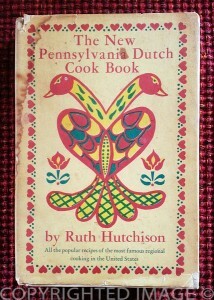 The Inquirer cookbook was a four-part series edited by Virginia Cheney, Home Economics editor for the Inquirer and Ruth S. Hutchinson, author of the Pennsylvania Dutch Cookbook. We’ve tweaked this recipe a little bit depending on the availability of vegetables and meats but the unique flavors of Pepper Pot come from the fresh tripe. But admit it, if you did not know about the ingredients in any really tasty dish, you would probably eat it and ask for seconds. I know I have. Try it once following either recipe to the letter and then make it your own with a few changes to suit all taste buds then serve it piping hot in the perfect soup bowl. Grab an apron. This recipe is somewhat more involved than many and requires a certain amount of food prep. I have a collection of aprons depending on the amount of prep required. Sometimes I use a cooking smock for complete coverage but for everyday cooking, I love my dark red linen bandage apron! To most of my family members, tripe is that one ingredient not to be discussed. 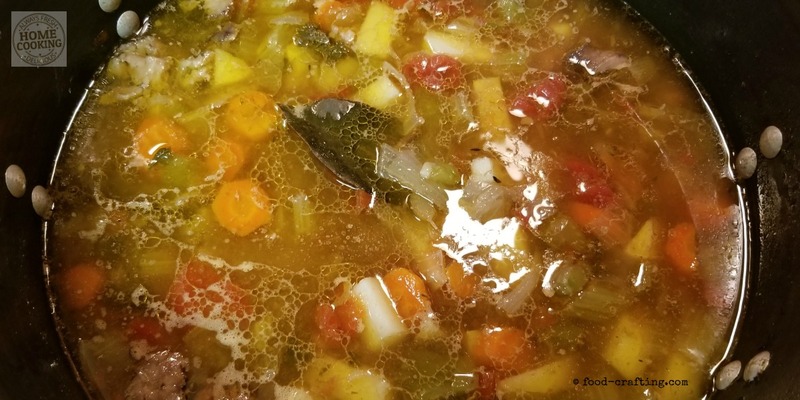 Just this week, the soup man made the following comment – “You’ve got to be kidding!” – yet he will come close to single-handedly eating the entire pot of Philadelphia Pepper Pot soup without a second thought to that one ingredient. But let’s face it, as a food, offal and particularly tripe are eaten all over the world in a variety of very tasty recipes. French recipes include some of my favorites dishes such as Tripes A La Mode de Caen (my recipe is coming up with leftover tripe from the Pepper Pot soup!) and Rognons de Veau. A recipe for Tripes A La Mode Caen is included in a famous Cordon Bleu cookbook! Who’s a fan of liver and onions? Anyone for beef tongue? How about steak and kidney pie? 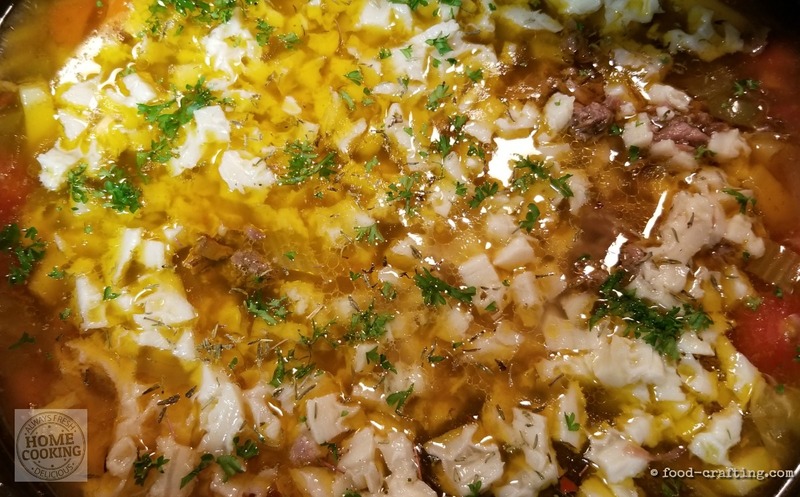 All recipes made with offal. Yes, tripe is chewy if not cooked correctly but its mild flavor is the perfect way to add protein to soups. Rinse and scrub the tripe under cold running water. Place in a large dutch oven and cover with cold water. Bring the water to a simmer on low heat and barely simmer (as in the water ripples rather than bubbles) for at least 5 hours or until the tripe is soft and easily pierced with a fork. Anything more than a low simmer will toughen up the tripe. What you want are extremely tender bits of tripe in the soup so make sure to maintain that low simmer from the start. 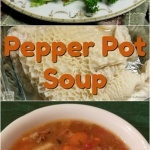 Pepper Pot soup is the perfect slow cooker recipe! I would still recommend preparing the tripe as I did – separately on a slow simmer for hours on end. By the time the tripe is really tender, the remaining ingredients would be mush. Prep it ahead of time. 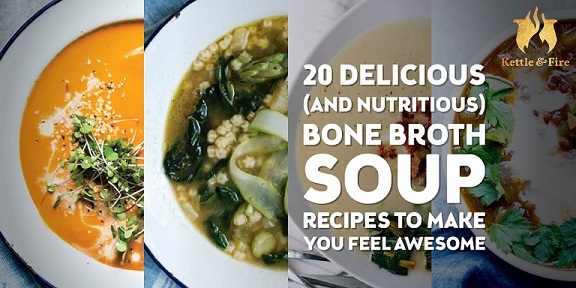 The rest of the soup prep can easily be made in the crockpot. Near the end of the soup and veggies cooking cycle, add the diced tripe. When you can’t find an ingredient – improvise. Veal knuckles were nowhere to be found so I used beef instead. For that peppery bite, I added a generous amount of red pepper flakes to cook with the broth. The Inquirer recipe calls for noodles or macaroni. You can only reheat those so many times. Use potatoes instead. I’m not crazy about cloves in anything except baked goods but I add a couple in the soup. The 16 inch oval prep platter I use in the kitchen is a memento of my mother-in-law’s kitchen. As the only remaining piece of a set, I use it for all my recipe prep work. It’s a vintage Noritake The Sahara porcelain piece. 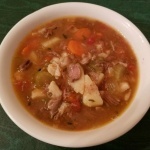 Pepper Pot soup is a Pennsylvania Dutch specialty from the Philadelphia area. The recipe below appeared in the Inquirer cookbook insert in 1949. This insert is one of two found in my mother-in-law’s recipe stash. 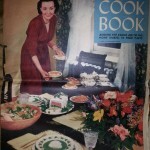 The Inquirer cookbook was a four-part series edited by Virginia Cheney, Home Economics editor for the Inquirer and Ruth S. Hutchinson, author of the Pennsylvania Dutch Cookbook. Copyright of the respective editor and author. Cut the tripe into one-inch squares. Put tripe and veal knuckle in a large soup pot, cover with cold water and slowly bring to the boiling point. Add peppercorns and thyme; simmer until the tripe is tender, about 4 hours. Strain, reserving the liquid and also tripe and veal knuckle. Boil down the liquid until you have about two quarts. Melt the butter or shortening and sauté the onions, carrots, celery and green pepper in it. Cook until the vegetables are soft but not browned, then sprinkle with flour and blend well. Slowly add the two quarts of soup stock. Add macaroni and canned tomatoes. Simmer until the vegetables are tender and the macaroni is cooked about 10 minutes. Remove the meat from the veal knuckle and but it into bite-size pieces or shreds. Add the tripe pieces to the soup mixture. Add salt and pepper and adjust to taste. Remove from the heat and garnish with parsley prior to serving. Philadelphia Pepper Pot soup was Dad’s favorite winter soup. As a Pennsylvania native and one-time Philadelphia resident, he often talked about a soup which to us seemed like one dish to avoid. Until we tasted it. It was easy to accommodate his and our taste buds when Campbell’s® still made the soup. Once discontinued, I set about duplicating the flavors of this regional specialty. This is the latest version. For best results, cook the tripe as directed below. Buy very fresh tripe. Wash and scrub the tripe under cold running water. Place in a large stockpot and cover with cold water until the pieces float. You want plenty of water. Bring to a simmer over low heat then reduce the heat until the pot barely simmers. Cover and cook for at least 5 hours, closer to six.. Mine cooked for close to 8 hours because I took a nap when I least expected to. You want the tripe to be incredibly tender. Once cooked, drain the tripe and refrigerate until ready to use. Before adding to the soup, cut it into a fine dice. You can prepare both the tripe and the rest of the soup in separate stock pots. In a large stock pot, add 2 quarts of water. Place the beef shank and knuckles in the water along with all the diced vegetables and seasonings. Bring to a simmer and simmer, covered, for a good hour or more. Remove the meat from the pot with a skimmer and add the diced potatoes. Simmer for another hour or until the potatoes are tender. Adjust seasonings and add any liquid if needed. While the soup continues to cook, cut up the beef (and tripe if you have not already done so) into small bits. About 30 minutes before serving, add the beef and tripe to the soup. Continue to cook on a very low simmer but the soup is ready to serve as soon as the meat is heated through. Philadelphia Pepper Pot soup tastes even better the next day! NoCry Cut Resistant Gloves – High Performance Level 5 Protection, Food Grade. Size Small, Free Ebook Included! Recently, while preparing several recipes that required dicing, chopping and slicing, I cut my fingers in rather unique ways. I will not post pictures to illustrate the damage but let’s just say that the cuts were surgical. It’s been a long time since I cut myself to such an extent. I thought I would break out the Mandoline but by then, not even the protective blade guard seemed enough to keep my fingers out of the way. Order a set of gloves and keep your fingers safe. At no point are fingers required to be part of any recipes! 7 Diced, Chopped & Julienned! I just want a good home made pepper pot soup. Previous Post Pork Tenderloin Medaillons: Best Garlic Mushroom Sauce Next Post Easy Skillet Chicken Recipe: Best You’ll Ever Eat!